OneDesk makes the insight management process easy, especially when it comes to the most important step – gathering feedback from your customers. Our customer portal allows you to gain valuable feedback about your products or services much quicker than with traditional survey tools. 1. Make sure the customer portal is activated. 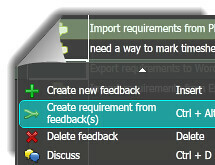 In your administration options, simply ensure that the box next to Activate Customer Feedback application is checked. 2. Choose what your customers will be able to access and view. 3. Send your customers to the customer sign-in URL. Customers can then submit feedback to your organization through the customer portal. 4. Once they do, receive the feedback in your user account and assign/classify the feedback to a project so that it can be shared/worked upon. 5. You can create requirements from feedback, or link the feedback to requirements. 6. Then, create tasks from the requirements or simply link the requirements to tasks. 7. Assign the tasks and have the feedback implemented in no time. What makes OneDesk’s insight management process unique? With OneDesk, companies and their business partners can communicate and collaborate with customers throughout the whole process. Social collaboration tools such a blogs, discussion forums, chat, polls and a voting system allow all parties to be clear on what is being requested, and always on the same page. All tasks are traced back to their original feedback, ensuring that everyone knows why they are working on the task. Companies can also choose to keep customers updated on their requests throughout the feedback management process, which leads to a better customer experience.